Easy and the Best Raspberry Pie Recipe I have EVER had the pleasure to eat. 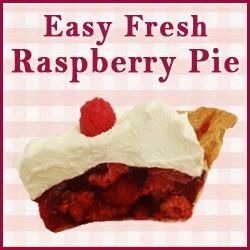 See just how quick and easy It is and how to make raspberry pie and other fresh fruit pie recipes. Prepare this recipe 5 hours ahead of time so the pie glaze has time to set. 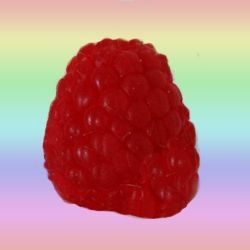 The following is a recipe using fresh raspberries but you can substitute frozen raspberries with easy modifications. I love Raspberry Recipes Desserts. Very Simple to Prepare this version of the Raspberry Danish Dessert. You can make your own homemade pie crust recipe if you choose. I found the Pillsbury Crust to be an excellent substitute for homemade pie crust. You may use Frozen Raspberries but you need to use less water. Sooooooo Yummy!!! 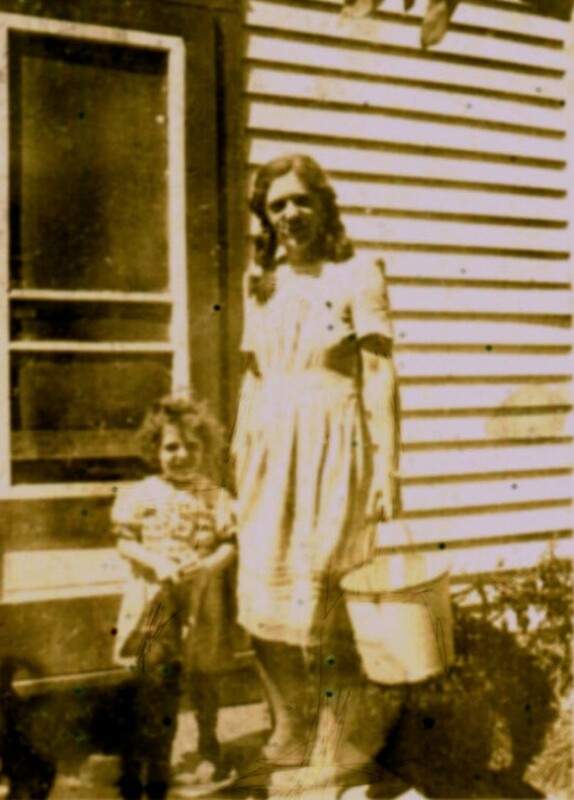 Make a Fresh Strawberry Pie Recipe Instead or how about a Fresh Peach Pie? If you freeze Raspberries while they are in season, you will have beautiful raspberries to make this luscious pie all year long or you can buy them in the freezer section. I bought 12 Raspberry Danish Dessert packages at Amazon (see links below) so I can make this modified pie glaze recipe or a sweet glaze to encourage family and friends to eat more fruit. This glaze is really great on many various fruits. My husband will eat more strawberries when I lightly coat the berries with this glaze. You can use this same recipe and make a Fresh Strawberry Pie Recipe or even a Fresh Nectarine Pie using the same Raspberry Danish Dessert. I love the versatility I have with Danish Dessert. I prefer the Raspberry Danish Dessert flavor over the Strawberry Danish Dessert flavor because it is a little more tart. I also substitute a bit of the water and add Fresh Lemon Juice to make it even better. I love lemon juice but if you don't, just use 1 3/4 Cup water and no lemon juice. If you have been wondering How to Make a Raspberry Pie or the Best Strawberry Pie Recipe, you will appreciate just how easy and delicious this is. See the kitchen dishes and small appliances I recommend too. See How to Freeze Fresh Raspberries too so you will be ready next time you are having company or your family has a craving for the Best Raspberry Pie Recipe you may have ever eaten. French Vanilla Ice Cream Recipe Video and How to make raspberry pie recipe below. To make this into a Strawberry Raspberry Pie Recipe, just add half fresh strawberries and half fresh raspberries. Remember, you can make this Fresh Strawberry Raspberry Pie Recipe using frozen raspberries or strawberries, but cut back on the amount of water you use because the frozen berries contain more liquid. See how to freeze raspberries below so you can enjoy this recipe all year long. Find the Stoneware Pie Dish (for a crispier crust), Raspberry Danish Dessert (Pack of 12) and handy Large Expandable Sink Colander for sale, to make this Fresh Raspberry Pie, BELOW. I LOVE these!!! ENJOY this really, really delicious Fresh Raspberry Pie! Where can I buy Junket? Super Delicious Fresh Raspberry Pie Recipe. You may lose control. Simple Raspberry Pie Recipe - So Easy and So Delicious. Your Family and Guest will LOVE this. You can make this Simple Fresh Raspberry Pie recipe from scratch but I found this modified Raspberry Danish Dessert recipe to taste even better than the Fresh Raspberry Pie Recipe I made from scratch. You can keep many of the ingredients on hand so you can quickly prepare the Luscious Fresh Raspberry Pie. If you make it in the morning or early afternoon, it will be ready for dinner. My mother has been making this simple raspberry pie for years and it is one of her most often requested recipes. Everyone feels special when she makes this them. I often freeze the Pillsbury Crust, Fresh Frozen Raspberries and you could have Cool Whip in the freezer as well but I never use Cool Whip but I usually buy the Heavy Whipping Cream Fresh. I ALWAYS make this Fresh Raspberry Pie with Heavy Whipping Cream. This pie deserves it. To make a Raspberry Strawberry Pie Recipe, just use 1/2 Fresh Strawberries and 1/2 Fresh or Frozen Raspberries. I personally would not recommend substituting Frozen Raspberries for the Fresh Raspberries as the Frozen Strawberries get too soft. See "How to Freeze Fresh Raspberries Below"
People are asking on the web, "where can I buy Junket?' Click on the Big Picture of Junket Raspberry Danish Dessert below. Less than $1.50 per box for this yummy dssert mix to make lots of easy fruit desserts. LONG Shelf Life on Danish Dessert Mix. Make Easy Raspberry Desserts and Pies with Raspberry Danish Dessert. you might be able to find this in Raspberry Danish Dessert flavor and Strawberry in your grocery store pudding isle. I can't find it anywhere where I now live. Your Family and Friends will LOVE this Tasty and Easy Raspberry Pie Recipe. You can substitute frozen raspberries if Necessary. Substitution will be in (Paranthesis) and are not my first choice. If you have a Delicious Homemade Pie Crust, by all means make that. This Fresh Raspberry Pie Recipe is simple and really Yummy but does need to be prepared about 5 Hours prior to Serving so the Pie Filling can set. Actual Prep Time is less than 1 hour. I allotted time for the cooling periods. You can do other tasks during this time. Basic Recipe is modified from the Raspberry Danish Dessert Pie Glaze Recipe on the back of the box. I could not find the Raspberry Danish Dessert packages in my local food store so I bought it here on Amazon. I received 12 boxes for less than $18.00 (prices can change daily) and Free Shipping with $25.00 total order. That is only $1.50 per box and your friends and family will be so excited if you decide to give them a box or two as a gift. Happiness doesn't have to cost very much. Here is the link for where can I buy Junket?. See the 5 STAR REVIEWS. Every single review (as of date of this publishing) is 5 STARS, WOW!!! Remove one of the rolled pie crusts from the Pillsbury Package and let it sit on the counter for about 20 Minutes (or Microwave for about 20 Seconds, 10 seconds at a time and don't let it get warm). Unroll the crust. Lightly dust with Flour is optional. Place the floured side down in a Stoneware Bakeware Pie Pan. Flute the edges of the crust with thumb and fingers. Poke the sides and bottom of the crust about 20 times with a fork to prevent puffing of the crust. Bake the Single Pie Crust at 450 Degrees for approximately 12 Minutes or Until Lightly Golden Brown. Let Crust Cool on a Pie Rack. (I use a Pie Ring to keep the Fluted Edges from getting too brown, see below). Note: I highly recommend a Stoneware Bakeware Pie Plate. You will never go back once you see how evenly brown and crispy your pie crust turns out. 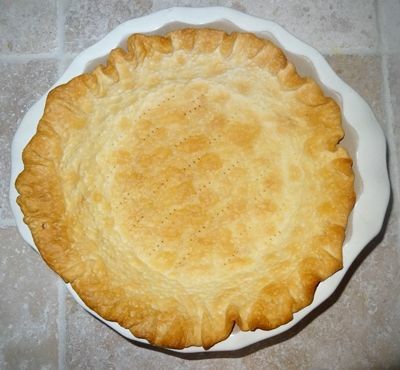 CLICK ON THE PHOTO of the Photo of the Pie using the Stonewear Bakewear Pie Plate. Clean Fresh Raspberries by Spraying with a Fruit and Vegetable Spray and thoroughly Rinse and Drain. 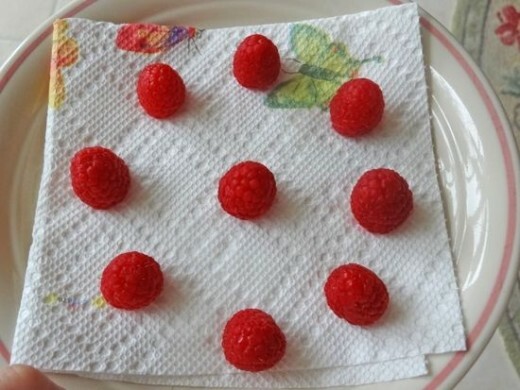 Set aside 7 to 9 Raspberries and put in these berries on a plate with paper towel and place in the refrigerator. While Crust is Baking, prepare the Raspberry Junket Danish Dessert. 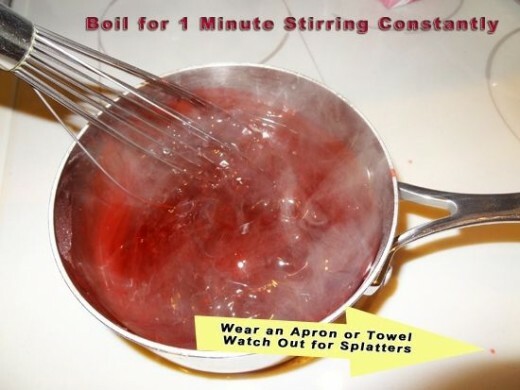 In a Medium Saucepan, Stir in the Raspberry Danish Dessert into 1 1/2 Cup Cool Water and 3 Tablespoons Fresh Lemon Juice (or 2 teaspoons Lemon Juice Concentrate). Bring to a Boil and Stir Constantly for One Minute. Be careful not to Splatter the Pie Glaze on your clothes. Cool slightly in the pan in the refrigerator for approxiately 15 minutes. Gently Fold in the clean Fresh Raspberries remembering to keep 7 to 9 Fresh Raspberries out for Garnish. Pour Raspberry Mixture into the cooled Crust and Cool in the Refrigerator for 4 Hours. In a Deep Bowl, Whip the 16 Ounces of Heavy Whipping Cream until slightly thickened. Add 2 to 3 Tablespoons of Powdered Sugar to taste. Continue Whipping the Cream until you suddenly feel a heavier consistency and it forms stiff peaks with an oh so slightly grainy appearance. This method of mine is a bit over beaten which helps the whipping cream hold up into the next day. 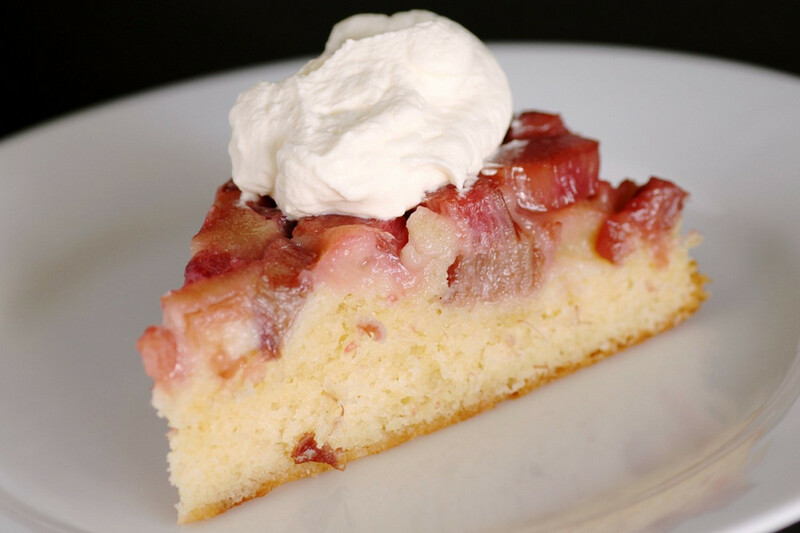 See photos with additional tips for whipping the perfect whipping cream. NOTE: If you don't whip the cream enough, it will break down quickly. If you whip the cream too much, it will get a grainy texture and will not spread out on the raspberry pie as well. Spread the Whipped Cream on the Fresh Raspberry Pie. Place 7 Raspberries on the Top for 6 Servings and 9 Raspberries on the Top for 8 Servings placing 1 in the Center. I could have made the fluting on the crust much nicer but as usual, I was rushed. It still tasted great. See below on How to Freeze Fresh Raspberries so you can make the simple raspberry pie recipe anytime of the year, summer to winter. My mom used to have raspberry bushes so I was really lucky to freeze a lot of berries. Place Fresh Raspberries in a large strainer and spray with an Organic or Natural Fruit and Vegetable Spray to help remove pesticides. After about 30 seconds, thoroughly Rinse the Raspberries and Drain Well. This is my favorite Expandable Strainer. It can even EXPANDS up to 22 inches to fit over the Large side of my sink leaving the garbage disposal available. 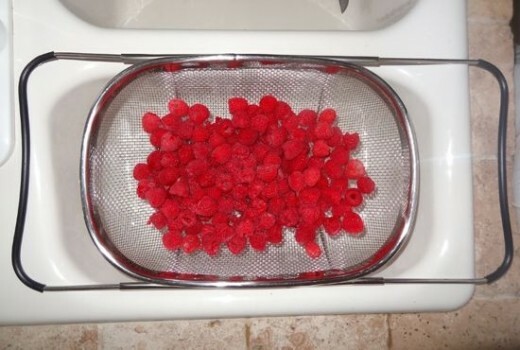 The large area of the expandable strainer also allows me to easily spray a larger portion of the raspberries without having to toss them around and break them up as much. Raspberries are so delicate. Be as gentle as you can. 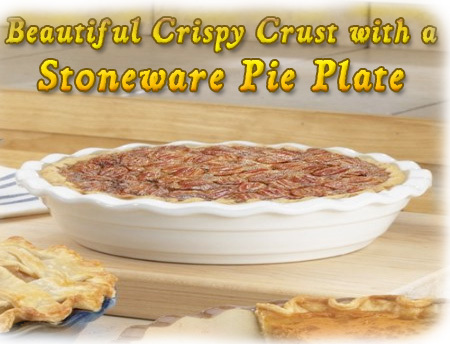 Bake your pie crust evenly and crispy in a stoneware bake ware pie pan. I rarely use any other pie pan once I've baked with stoneware bake ware. Stoneware Pie Plate and other Stoneware Baking Dishes will become your favorite. I have been baking with stoneware bake-wear y=for over a decade now. Every single time, the dishes come out more crispy than any other bake-wear that I've ever used. Only $1.50 per Package of Raspberry Danish Dessert for this Pie Glaze or use as a delicious Fruit Glaze your family can't resist eating their berries. I recommend that you venture out and make Heavy Whipping Cream vs Cool Whip for the Fresh Raspberry Pie Recipe. If you never tried making fresh whipping cream, this is your chance to try. I have just a couple of tips to making the perfect whipping cream. It is very fast and easy. Just don't OVER Beat the cream. I over beat the cream just a bit so it holds up for a longer period of time. Beat Whipping Cream until SLIGHTLY Thickened and Add 2 to 3 Tablespoons of POWDERED Sugar to taste. Resume Beating and Beat Scrapping the Sides Continuously until the Whipped Cream becomes stiff and only an oh so slightly grainy appearance. See Photo Below for the texture that I like. This is actually a BIT over whipped but I found the cream will hold up for a full day when I whip it just past the perfect point. If you continued to whip past this stiff point, the cream will not spread nicely and it will get an even more grainy appearance. Spread the Whipped Cream on Top of the Completely Cooled Fresh Raspberry Pie and Garnish with the Reserved Berries. Place One Raspberry in the Center of the Pie and the remaining 6 Raspberries for 6 Servings or the Remaining 8 Raspberries for 8 Servings. The Fresh Raspberry Pie tastes the very best the First Day. When possible, make this pie 5 hours prior to serving. It will definitely still taste great the next day too but the crust will get a little softer. I typically don't cover the pie in the refrigerator the first day but I do cover it up for overnight. 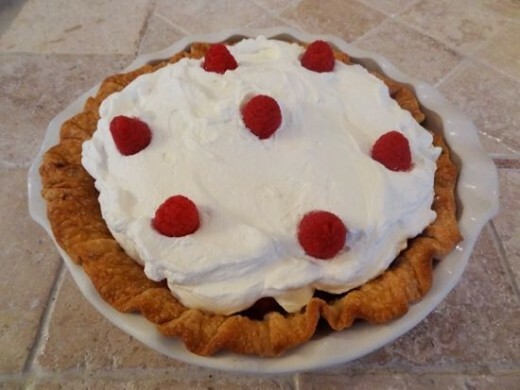 You can use an aluminum pie plate to cover the Fresh Raspberry Pie to avoid disturbing the whipping cream. If you absolutely MUST, you can use Cool Whip or Ready Whip Real Whipped Cream. The Ready Whipped Real Whipped Cream is my second choice but spray the cream on the raspberry pie as you serve. 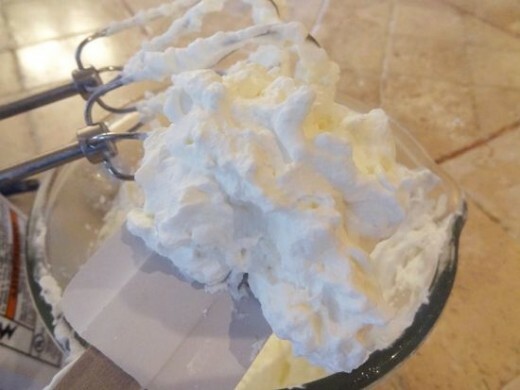 This whipped cream will not hold up so spray on each individual slice of pie as you are serving it. I actually Over Beat the Heavy Whipping Cream just a Tiny, Tiny Bit until STIFF Peaks Form. Through the years, I found that by beating the whipping cream just past the perfect whipped cream stage, the cream holds up longer. Otherwise the whipping cream gets a bit too soft and soupy quicker. If you know you are going to eat the pie within a couple of hours from beating the cream, you can beat it a little less to achieve the perfect whipping cream texture. Stop beating when you can see soft peaks form. It goes quickly so be prepared to stop beating quickly. Again, you can use Ready Whip Real Whipped Cream or Cool Whip if Necessary. I NEVER EVER use anything but Real Heavy Whipping Cream found in a Pint Sized Carton in the Dairy Section. To me, it would not be as good. My mom tried fooling me as a kid but I always knew if she substituted. She used Dream Whip back then once in a while. For every day beating, I use a handy but yet powerful Kitchenaid Hand Mixer. 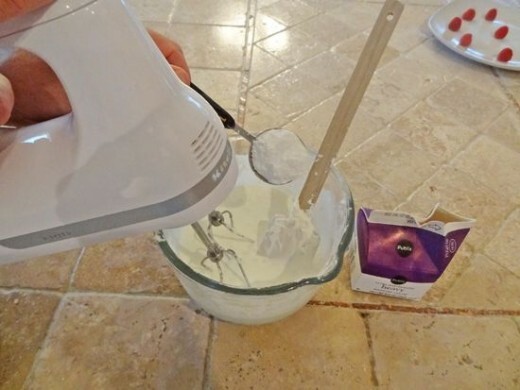 If I had to do it again, I would buy the 9 Speed Hand Mixer but I didn't have time to shop on a Holiday and my son ran out to buy my 5 Speed which I am content with. 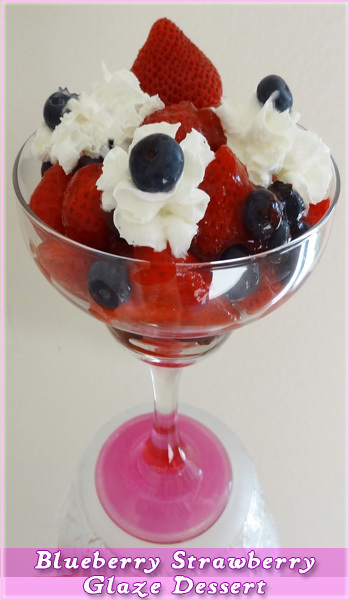 For more ideas for recipes using fresh raspberries, visit the French Vanilla Ice Cream Recipe Youtube vdeo below. 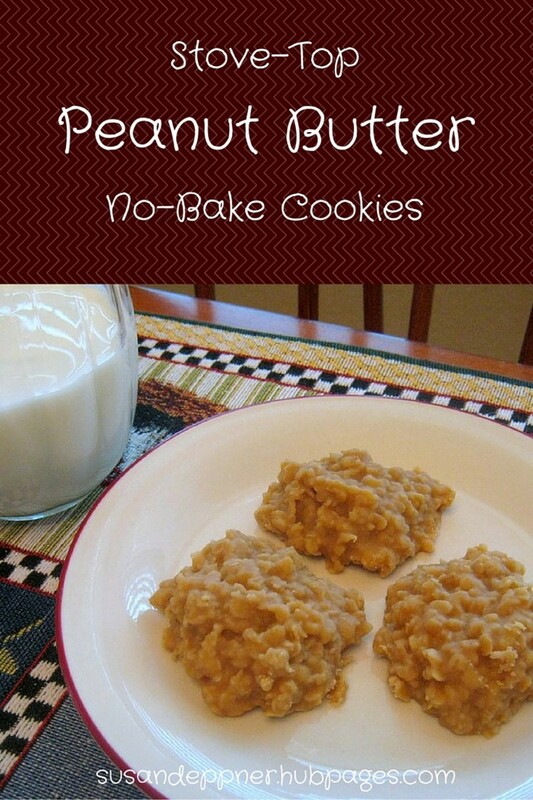 Wouldn't this be super yummy too. Make sure they are fresh frozen raspberries in a bag with NO juice. Drain well on a paper towel. Encourage your family to eat more fruit by LIGHTLY glazing the fresh fruit with strawberry or raspberry danish dessert. Just follow the recipe on the box for the galze and add 3 Tablespoons of Fresh Lemon Juice or 2 teaspoons of Lemon Juice Concentrate for an added tangy flavor. Toss in clean cut up fresh fruit and lightly stir. Eat warm or chilled. You can top it with a little whip cream if desired. Here is a photo of the Glazed Strawberries and Blueberries I just made to get my husband to eat more fruit. Slowly cut back on the amount of the glaze until your family will eat fruit with nothing on it. 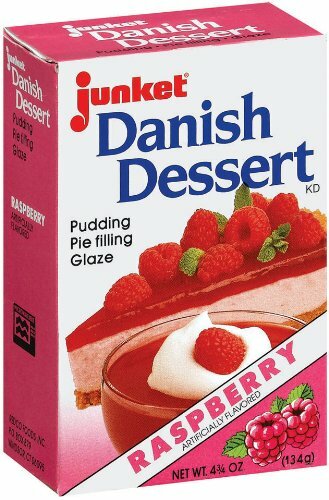 Once you discover how fast and easy it is to make quick and really tasty desserts, you will be hooked on Junket Danish Dessert. If you prefer the Strawberry Danish Dessert Glaze Mix, here is the link straight to Amazon. By buying 12 Packages, you can often get Free Shipping. I keep boxes in my pantry for quite awhile and I enjoy giving them to my friends to try just how delicious Danish Dessert Mix is. I couldn't find it in my grocery store so I bought the package of 12. It is only $1.49 per package. My shipping was free because I purchased another item to bring my total up to the $25.00 to get the Free Super Saving Shipping. Great Deal. I actually prefer the Raspberry Danish Dessert flavor over the Strawberry because the raspberry has a little bit more zip. I even use the Raspberry Danish Dessert for every fruit that I have used so far. Which of these two Pies do you like Best? How to Freeze Fresh Raspberries - Keep Frozen Raspberry in Freezer for Raspberry Desserts too. To Freeze Fresh Raspberries while raspberries are in season or on sale, I recommend not washing them prior to freezing because raspberries are very delicate. You will need to label your container with the Fruit Type, Date and a Note that they are not washed. This is the best way on how to freeze fresh raspberries because the fruit stays in better condition, takes on less moisture than if you wash the raspberries and easily to measure out the needed amount. I even measured out 4 Cups of Fresh Raspberries for each container because I usually made the Fresh Raspberry Pie Recipe or Raspberry Strawberry Pie Recipe you would use 2 Cups of Frozen Strawberries and 2 Cups of Frozen Raspberries. Recipes using Fresh Raspberries are Incredible. On a cold winter day when you have a craving for something sweet and delicious, you will be so happy you read read "How to Make Raspberry Pie" and "How to Freeze Fresh Raspberries"
See above recipe for how to make raspberry pie. Fresh Raspberries on top of this French Vanilla Ice Cream, oh my! How to Make Raspberry Pie Recipe Above. 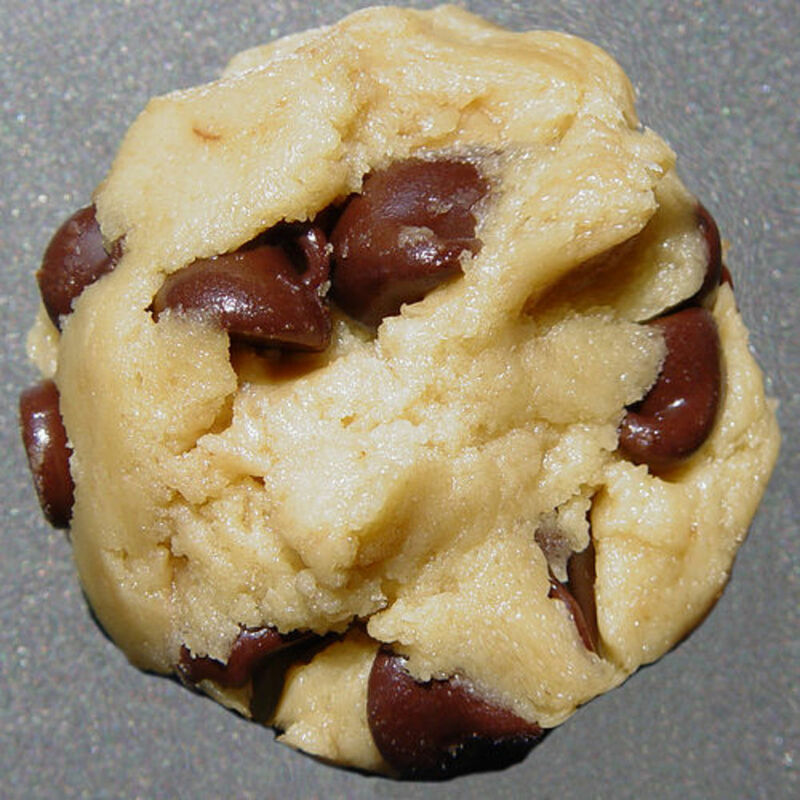 For Detailed Recipes, See Above. Here are my Top 5 Products to Help you make this and other Pie Recipes. I own everyone one of these similar products and would not want to be without any of them. Expandable Strainer Even Fits across even my larger side of the Sink and it my "Go to Strainer"
Hand Mixer I own the Kitchenaid Hand Mixer but I also like the Quality of Cuisinart. I like how this Small Hand Mixer has it's own Storage. You can see my Hand Mixer above. Cuisinart Citrus Juicer. I am crazy about my Cuisinart Citrus Juicer. I buy a bunch of Lemons and Limes then Juice and Freeze them for Every Day use. I wish my Cuisinart had this nice Curve so the bowl could get closer to the juicer. Raspberry Danish Dessert. You can buy it in Strawberry Flavored too buy I like the Raspberry Danish Dessert best because it is a bit more tart. I even use this Fresh Nectarine Pie, Best Strawberry Pie Recipe and as a fruit glaze. Sooooo yummy. Peanut Butter Pie - with Chocolate: Yummy Frozen Dessert! Lovely photos, looks delicious, ready to be bookmarked! My husband would love this pie. I like this lens, well done! 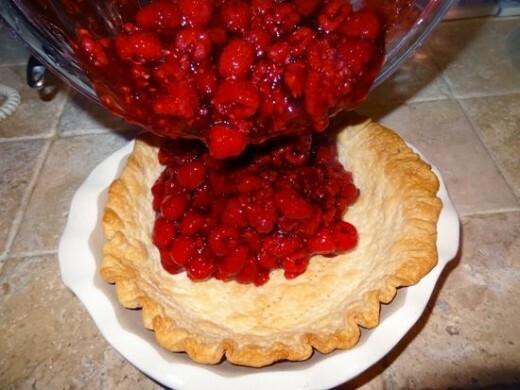 I would love to make you all some Fresh Raspberry Pie. Thank you for stopping by. 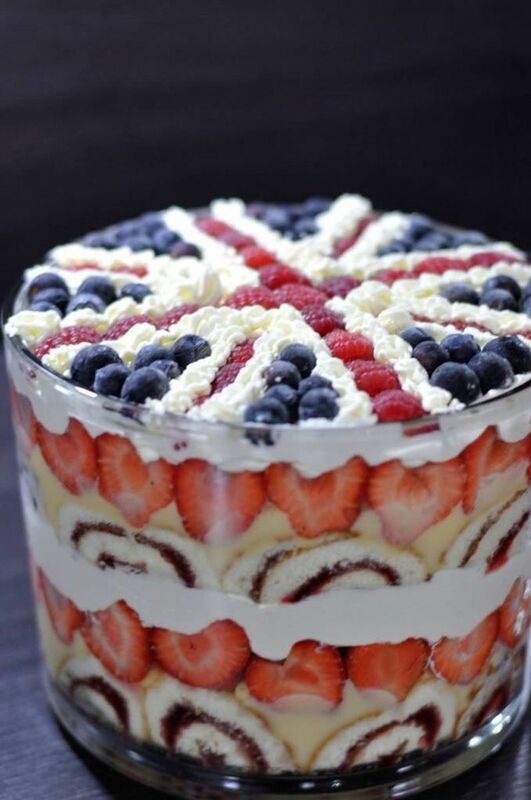 It looks and sounds yummy! Thanks for sharing! I love me some pie, makes me hungry after looking at this lense. @favored: My mother and I both don't think this pie would freeze too well because we think the crust would get a bit wet. If you try freezing it, please let us know how the crust held up. Thank you for the very nice compliment about the pie and lens. I freeze pumpkin pie and the crust stays nice. @anonymous: The pie would be a great dessert after we eat your yummy Hamburger recipes. Thank you for encouraging me to finish this lens to work toward becoming a Squid Angel. 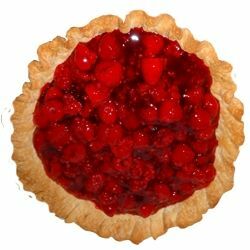 This raspberry pie looks so good; I'm going to try it. Can you freeze it after it's baked? 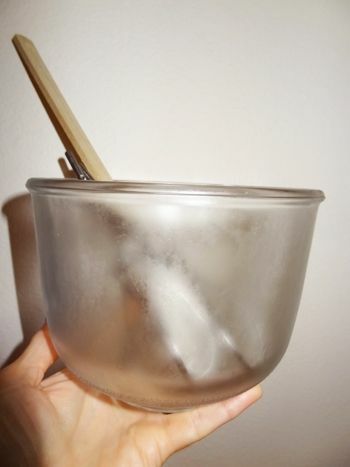 Love your photos and that strainer!. Everything was made so clear and I like how you showed us the materials you used. Really nice job. Blessed.